sky was filled with them. *Contrast adjusted for better viewing of cover. 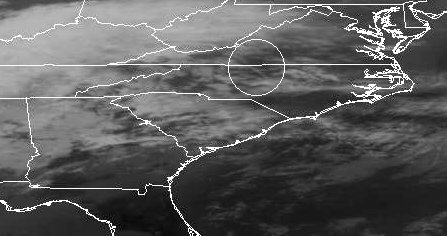 Note "X" in area circled over North Carolina. Report: Trails started this morning at sunrise, 0600mst. First ones SE to NW for about an hour, then over central Pnx and N. of Pnx~10 miles in a due East West and reciprocal West East pattern. They continue as I am posting. *Contrast adjusted to enable better viewing of cover. 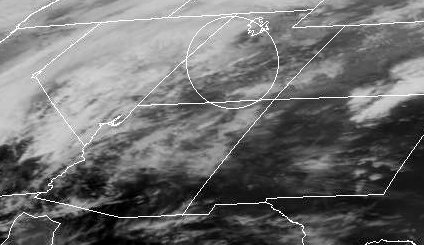 Check out area in the circle in Colorado - Possible persistant contrail formations. Report: it's 0800hrs mst Trails very noticeable at dawn ~0630hrs. They are running this morning about 20 degrees off due N. S. Coming from NE-->SW, primarily. Note multiple "X"s in Big Bend area of Texas (circled). 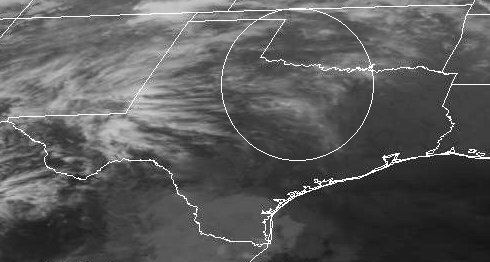 These formations later included more "X"s.
Report: Trails and conclouds began developing over the north Texas area north, south, east and west of my location in The Colony, Texas (about 20 miles north of downtown Dallas) early this morning - 1-14-00. The sky directly overhead was deep blue until later afternoon when the trails began appearing over my area. I could see some kinds of clouds that looked like conclouds to the north and south but I wasn't sure they were trails until they began appearing over my town. Contrail formations observed forming behind aircraft among cirrus-like clouds by witnesses on the ground (see circled area). Note activity in Utah (see circled area). 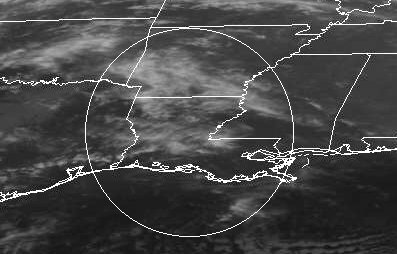 since about 6:30 Pm CST, but there is a strange haze in the sky.